It's a so-called shield volcano, which is typically broader in shape and has lava that is relatively fluid. Hawaii’s Kilauea volcano spewed ash 30,000 feet above the island on Thursday, but while it remains one of the most active volcanoes in the world, experts say the type of eruptions that are occurring in Hawaii now are inherently less deadly than some of the biggest in history. Historically, Kilauea’s rumblings have not been as deadly as other volcanoes around the world, said Steve Malone, an emeritus research professor of volcanology at the University of Washington in Seattle. “With the Hawaiian volcanoes, you get that nice, red runny stuff, but they’re generally not nearly as explosive,” Malone said. This is because Kilauea is a so-called shield volcano, which is typically broader in shape and has lava that is relatively fluid. On the other hand, stratovolcanoes — which include Mount Pinatubo in the Philippines and Mount St. Helens in Washington State — are usually taller and have more viscous lava flows with trapped gas that can generate volatile explosions. “With stratovolcanoes, when that lava reaches the surface, you get a very sudden expansion of that gas, and this generates a much more violent explosion,” Malone said. Mount Pinatubo last erupted in 1991, killing more than 350 people in what became the second-largest eruption of the 20th century. Mount St. Helens last rumbled to life in 2004, but a massive eruption in 1980 killed 57 people and blew ash over a dozen states. Volcanologists aren’t expecting Kilauea’s eruptions to be nearly as dangerous, but they could still pose a threat. As the volcano continues to erupt, the lava lake at Kilauea’s summit is draining below the water table, allowing groundwater to seep into the system. “When that happens, the groundwater gets superheated, flashes to steam and can generate big explosions,” Malone said. Last week, scientists said that if Kilauea’s lava lake drains too fast, it could trigger explosions that hurl refrigerator-size boulders into the air. Thursday's eruption, which occurred before dawn, produced an impressive ash plume, but otherwise caused minimal damage to surrounding areas. Authorities issued an ash advisory that lasted until noon, but did not report any other immediate risks. Kilauea has been erupting continuously since 1983 and an uptick in volcanic activity that began two weeks ago has already destroyed at least 26 homes and caused thousands of residents to evacuate. Eruptions are expected to continue over the coming days. CORRECTION (May 18, 2018, 11:25 a.m. ET): A previous version of this article misstated the last time Mount St. Helens erupted. The last eruption started in 2004 and continued until 2008. 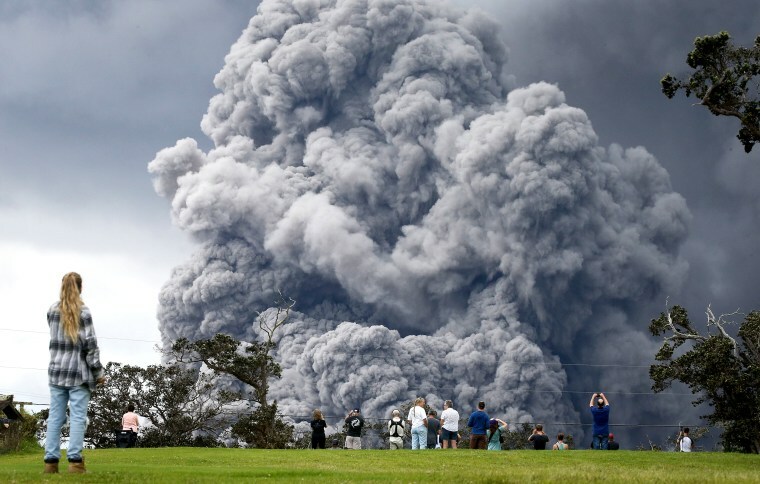 It did not start erupting in 2008.